They say that breakfast is the most important meal of the day, and for wee Waits Rebhal that couldn’t be more true. This is the only time he’ll reliably eat – afternoons are spotty and dinner depends entirely on mood. But morning meals are consistent, so this is where I seek to maximize nutrition. Waits still doesn’t eat a whole lot of quantity, so my focus is on offering a wide variety of options – all of them of the highest quality. A little taste of everything, to both broaden his palate and to mix up the vitamins and minerals. Of course, he’s still getting the vast majority of his needs met through breast milk. It’s also important to note that we only introduce one new food at a time, and keep a careful eye out for allergies/reactions. So, what does the Bonzai Baby eat for breakfast? 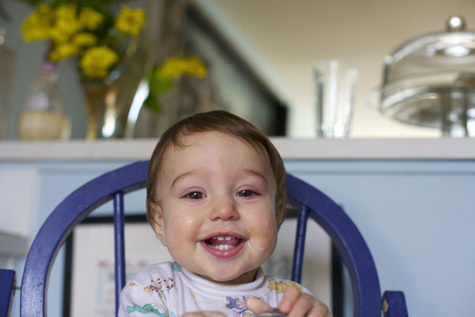 Growing babies need lots of fuel in the form of straight-up calories. But more importantly, babies are building their big brains – brains which are mostly made out of fat! Basically, the human brain is a big ol’ lump o’ lard. And that’s why dietary fat is so important for development. The “cream” separates, rises to the top, and hardens (in the fridge). This makes it a breeze (and clean!) to serve and it’s easy for babies to eat. It literally melts in the mouth! 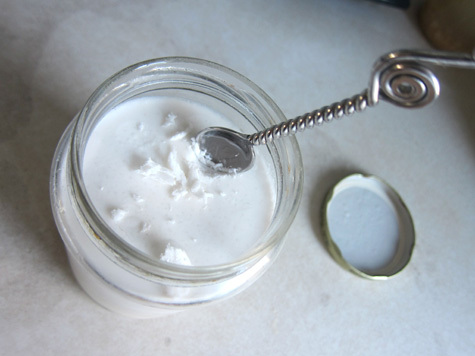 Coconut is uniquely high in a rare medium-chain fat called lauric acid . . . which is also an important component of breast milk! So coconut yogurt is basically a direct delivery of probiotics and ideal fats. Perfect baby food? Methinks! 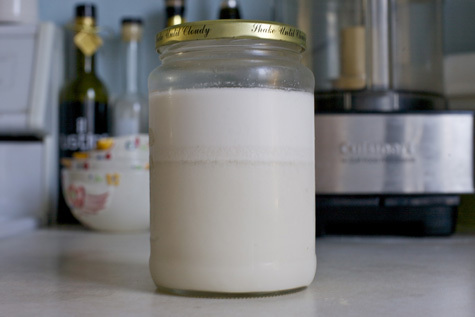 Learn how to make your own yogurt at home here. Other sources of excellent fats include avocados (this is a really great “first food”, unfortunately Waits is intolerant – yeah, I cried), olive oil (added to purees), flax oil (for essential fatty acids), and hemp oil (also for essential fatty acids). Most authorities recommend holding off on nuts and nut butters for at least the first year. Waits takes after his mommy for sure, and we both adore a good smoothie for brekkies. This is definitely not a “first food”, as you’ll need to introduce each ingredient on its own before giving the blend a go. But you can start super simple – banana/spinach/water – and then increase complexity as more options cross to the safe side. This is a SPECTACULAR way to get nutrient-dense greens into that picky little mouth. 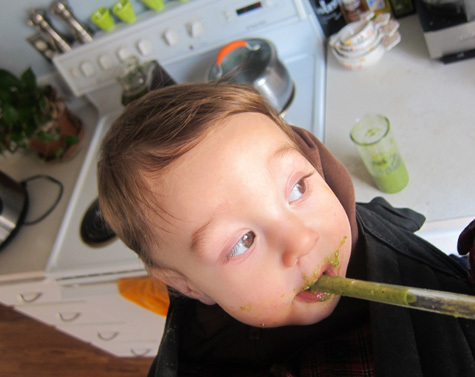 And start them nice and young, so it’s normalized before they realize that drinking green sludge is supposed to be weird! Fruit is great because it contains key vitamins and minerals. However, it’s also full of sugar! We do fruit but try to keep it in moderation, lest Waits develop an unhealthy “sweets bias”. That said, a hunk of banana is great for gumming and even better for squishing through baby fingers! FUN! 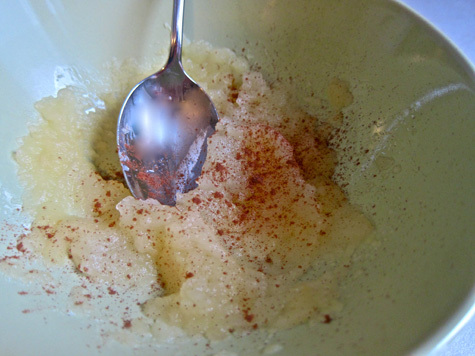 Waits is a fan of apples, both steamed and raw, made into ‘sauce’ with a little cinnamon. He also loves frozen blueberries and raspberries, thawed to the perfect texture. When they warm up they get delectably mushy! Is it a food or is it a supplement? Who knows, but we take it daily! 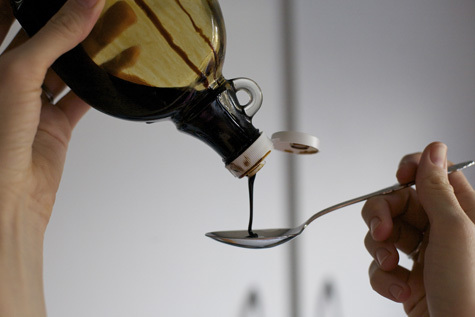 Blackstrap molasses is incredibly mineral-rich, boasting 20% of the daily allotment for calcium and iron. I took a tablespoon every day during the final phase of my pregnancy and it helped to fend off the dreaded third-trimester anemia. I started letting Waits lick the spoon when he was roughly 6 months old. At his 9-month iron check, he was in perfect range (many, many babies/toddlers become iron deficient – cows milk is a big contributing factor!). Coincidence? I’ll never know . . . but I love me some molasses! And that’s how breakfast goes here at HQ. Coming soon – Vegan Baby Dinners! I love this post, it’s so wonderful hearing about what you do with your boy. And what an amazingly cute little man!! Can’t wait to have my own herbivore babies! How do you take your molasses? Do you put it in smoothies or oatmeal? Sounds like a good idea I’ve just not used it in anything other than baking! Thankyou for this website. It’s inspirational! And I wondered, will your book be available to buy in the UK? The eyelashes on that child are amazing! These are all really great healthy breakfasts. I love a bowl of mashed banana and avocado with a splash of almond milk too. 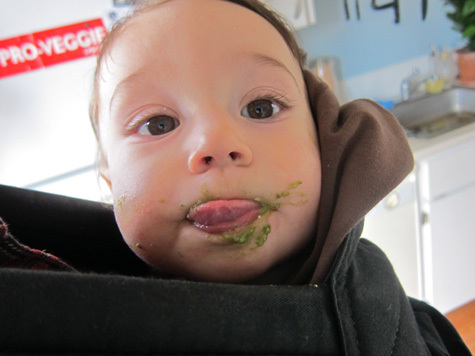 It’s not just baby food, it’s good stuff! I second Jen – I was going to ask that too – do you literally swallow a tablespoon of molasses? (That’s what it looks like from the photo haha). I know I’m iron deficient and I keep blackstrap molasses around – for baking – for that reason, but I never thought to actually, I don’t know, eat it plain? Ha. I will certainly try some molasses for my bambino. What are you planning to do for “milk” when cow’s milk is customarily introduced? I am getting really pushed to feed my child cow’s milk which I don’t think is healthy for a variety of reasons. But they say he needs it for the fat and for the calcium. I am hoping to still be breast feeding but apparently that isn’t enough? You should figure out how to make a vegan shoo-fly pie. It has a molasses-heavy filling, popular in Pennsylvania. SO GOOD. So I had a logistical question, is breast milk still considered technically vegan? Now, I understand you can consent that you want to give this child your milk, but breast milk is still considered a dairy product. What are your thoughts on this? Jerry… Breastfeeding your own child sounds like the most natural thing in the world. That’s why milk exists in the first place – cow’s milk is for calves and human breast milk is for babies. I don’t believe breast milk is ever considered vegan, it’s obviously not a plant :) lol. Sayward, what do you think really is the reason for children being intolerant to some foods? As a child I was intolerant to most foods (I wasn’t allowed to eat basically anything besides oatmeal, banana and a few more tasteless things) but I grew out of it and became allergic to dust mites and cat fur, which I enjoy much more (if one can say so). But what’s interesting is that I still suspect that there might be a few foods I don’t tolerate that well but I don’t ever want to find out because I believe that allergies are highly psychosomatic. And I’ve always thought food allergies have a lot to do with chemicals/pesticides found in the foods. But you probably only feed Waits organic stuff? My little one is the opposite, she’s not too bothered by breakfast, preferring breast milk but loves her lunch and dinner. I’m also proud to say my 100% breast fed baby had perfectly good iron levels as well. And fruit smoothies are a great way to get a reluctant toddler to eat some fruit. Jerry, not being a vegan I can’t really answer your question as to whether breast milk is considered technically vegan or not. But breast milk is so much more than a “diary product”. Its a food thats tailored to a babies needs, changing its composition as the baby grows and develops. It is the very best start you can give a baby, vegan or otherwise. Breast Milk isn’t really a “dairy product”. Yes, it is, technically speaking, an animal product – but one that is specifically intended for human infants. 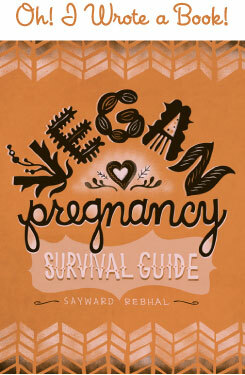 And if the mother is Vegan, like Sayward is and like I was when I was breastfeeding my children, then it can still be considered as part of a vegan diet for an infant. I have never met a vegan (myself included) that didn’t consider breast milk vegan. This is just awesome! If I ever have kids, your blog is going to be a wonderful wealth of information! @ Abby – I don’t plan to do a replacement for milk as far as something to drink straight-up out of a cup. I think Waits can get plenty of fats from food and I’ll make sure he has a great fatty diet. =) For calcium we do the molasses, the green smoothies, and various other plant-based sources. I may look into making my own fortified alt mik if I feel like he’s not getting enough, but I don’t think that will be the case. I would hesitate to do store-bought fortified alt milks because they are so processed and usually full of sugar, but that is just my own personal opinion. If I did decide to do store-bought alt milk, I would choose hemp or coconut first, followed by almond. I think rice milk is the least nutritious of all the alt milks. @ Kate in SB – oh NOM! @ Minna – Honestly, I don’t know! I have my theories – that the INSANE rise in the 4 A’s of the next generation (autism, ADHD, allergies, and asthma) must be a result of increased toxicity (environmental, plastics, pesticides, vaccines, etc) That’s what makes sense to me, but you know . . . I’m not a doctor. I think it’s interesting that each of these disorders is intimately tied to gut health and all of them can be eased/cured through digestive rebuilding. One more reason to eat the beasties! 2) You don’t have to use an infant starter – certainly plenty of people feed their babies/children regular store bought yogurt. That said, I *do* use an infant probiotic to make my yogurt these days. I forgot to mention that! I figure why not? Specially designed for his little tum. I use Udo’s and am happy with it, and the company has a good reputation. Have you seen the film “Babies”? It has a similar sort of takeaway. It’s available on Netflix streaming if you’re interested – it’s an awesome movie! @ Sayward: You mean this one: http://www.imdb.com/title/tt1020938/ ?? I heard a lot about it, always wanted to see it. Babies was awesome. I tend to call it a documentary but I guess it’s not really that, is it? Kinda though…..
a little late, but we came up with a persimmon-ginger-molasses smoothies that is AMAZING. The molasses enhances the subtle sweetness of the fuyu persimmons to the point where it tasted like a persimmon-y cake batter with a hint of tartness from the ginger :) it totally soothes my tummy & helps me out when I can’t keep food down. I’ve been adding mine to chocolate banana coconut smoothies, and the bitterness of the black strap molasses complements the cocoa powder nicely. sayward, and anyone else who gives their child coconut milk, at what age did you introduce the coconut milk/yogurt? i got some organic coconut milk (says its “original” rather than light, hopefully this means it’s full fat!) but the ingredients are coconut milk & guar gum. does your milk also have the guar gum, or does this indicate it’s processed more and that i should look for another kind of coconut milk? i am so excited to make yogurt for simon! @sara thomas: The only alt milk we introduced Nina to before the age of 18 months was rice milk (lowest risk of allergic reaction). However, our situation may be unique in that Nina has a close relative with very severe food allergies to just about *everything*. Since allergy testing on wee ones is not reliable at such a young age, we didn’t want to take any chances with Nina before we could have her tested. 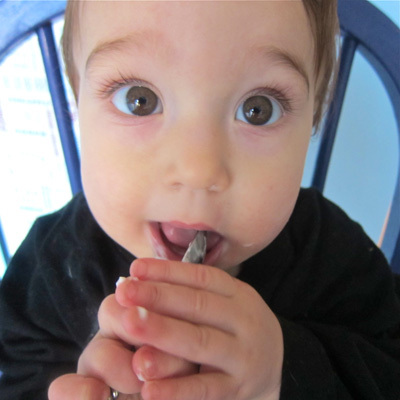 Once Nina weaned from breast milk (at 15 months), we slowly introduced full fat coconut milk. Guar gum (and also xanthan gum, carrageenan, the list goes on and on) can trigger an allergic reaction in some people who have other allergies-esp gluten, so we avoid these additives as much as possible. Don’t get me started about fighting with a pediatrician over vaccinations. All I can tell you is to stick to your guns, do your research and prep for possible confrontations so that your doc doesn’t make you feel flummoxed or start to doubt yourself, and hang in there!! I have so much more to add on this subject but need to get to work. @windycityvegan thanks so much for your help & encouragement! i’d really like to go right to the coconut milk with si for the fat, but am a little worried about the “extras”. wonder if you can get it without the guar gum somewhere? @sara thomas: Yes, you can absolutely get it without any stabilizers/additives! The only private label I remember seeing that does not have any added ingredients is Trader Joe’s. I can’t remember the brand names I’ve seen that contain just coconut and water, but they’re available at my co-op and Whole Foods. Pretty much anyone I know who drinks coconut milk buys the So Delicious brand – but no one in my family drinks coconut milk (unless it’s in a smoothie), so I just buy cans of the full fat stuff that I use mostly in recipes. Sometimes if I get on a roll making alt milks, I’ll make my own coconut milk from filtered water and dried/organic/unsweetened coconut flakes. @monika i am having a real hard time finding a good coconut milk =( we dont leave near a whole foods, or trader joes, or anything close to them unfortunately. i even looked online to see if i could order some and everything i have found has guar gum. i am also worried about making sure there is no bpa in the can as well. how hard is it to make coconut milk using your method with the dried/organic/sweetened flakes? is this something you’d be willing to share with me? @sayward- when you give the coconut yogurt to waits, do you just have him eat the fat off the top? or do you mix the fat in by stirring the yogurt and then feed it to him? I make so many alt milks nowadays at home that I rarely measure anything – I’m sort of a fly-by-the-seat-of-my-pants cook. Hope this recipe works for you – it’s ridiculously easy! I had not heard of people eating molassses straight, instead it was always in something yummy. What a great idea for any iron deficiencies though. I take 1 tablespoon per day.